Issue #19 of Spire Barristers' Family Law Newsletter: edited by Jacqueline Thomas and Sarah Blackmore; news and Case Reviews by Gemma Carr. Articles from around the web, Legislation updates and Case Updates from Care Proceedings and Financial Remedy matters. 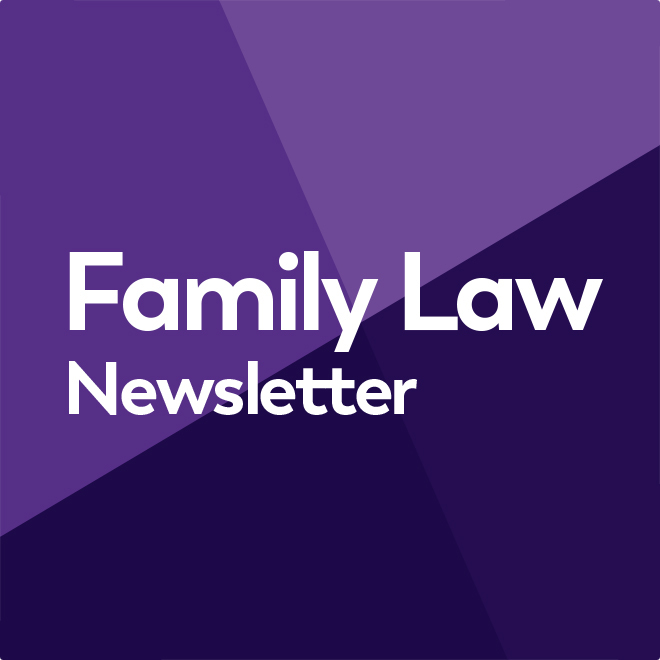 Subscribe to receive Family Law Newsletter notifications or email us to give us any feedback. Unsuccessful application for permission to reopen findings of fact in a case involving non-accidental injuries to a child. A mother applied for permission to reopen a fact finding made in 2010, that she could not be excluded from a pool of perpetrators who inflicted injuries on their child (“Y”). Y was made subject of a care and placement order as a result of the injuries suffered. Y was adopted together with the mother’s other child (“X”). The mother applied for permission to reopen the findings on the basis there was new evidence to suggest there might be a medical reason for the injuries. After the proceedings, the mother was diagnosed with hypermobility type Ehlers-Danlos Syndrome and vitamin D deficiency. She states that Y could have the same conditions and that would explain the fractures. She sought to appoint a geneticist to investigate both herself and Y. The Judge allowed an opinion to be sought from a consultant geneticist to assist with ascertaining whether the first stage of the test was met. The mother was clear that even if she was successful, she did not want the return of the children to her care. The mother sought permission to admit into evidence three reports from alleged experts. They were obtained informally, without the permission of the court, and not in line with court procedure. The court declined to accept the reports of two of the experts but still considered them as part of his judgment. He gave permission for one of the experts to be admitted into evidence because he was well known to the court and had the necessary expertise. Mr Justice Keehan preferred the evidence of the expert he initially allowed to be sought. The expert worked on the basis that Y did suffer from hypermobile EDS and vitamin D deficiency, stated that in the absence of any event of inappropriate trauma or force, these conditions would not result in fractures or predispose Y to suffer fractures. The court concluded that the mother’s case was “smoke and mirrors”. She did not establish solid ground for challenging the original findings nor would a rehearing result in anything different. The mothers application was dismissed. Application by mother for permission to make an application for contact with adopted daughter. Permission refused. R is a seven-year-old girl who had been adopted. Her birth mother sought to have permission to make an application for contact with her pursuant to section 51A of the Adoption and Children Act 2002. Essex County Council applied for permission to apply for an order prohibiting any direct contact between mother and R. The Councils application is not being proceeded with. The mother represented herself at the hearing. Part of her case was that what happened in the past should not be considered as significant in the decision today. The Judge did not agree with this, and reaffirmed it is the duty of the Judge to consider what has happened in the past and the previous judgments as part of the overall deliberations. On 11 May 2016 the court made a final care order and placement order for R. The final care plan said there would be letterbox contact between R and her mother twice a year. The mother sought permission to appeal and in August 2016 that was refused. On 17 August 2016 there was the final contact between the mother and R, during which she tried to remove R from the centre. In October 2016 R was placed with her adoptive parents. The Judge took into consideration section 67 of the Adoption and Children Act which states that a child is to be treated as if born to the adoptive carers once an adoption order is made. R was reported as being worried her mother would remove her when she was older and that the social worker would bring her mother to see her. R’s social worker stated that reintroducing R with her mother is likely to destabilize her and go against all the work and reassurances the child has been given. The Judge refused to give the mother permission to make the application as she was satisfied that if the mother was given leave to apply for a contact order, there would be a grave risk that R’s life will be so disrupted that she would be harmed by it. Taking into account the prospects of the mother succeeding in an application for contact if leave was given, the Judge considered her prospects are no more than minimal. In the Judges view, it would be unsafe and emotionally traumatic for R and her parents. Care proceedings in relation to a two year old boy, in which the local authority alleged that the mother had fabricated and exaggerated medical symptoms in him throughout the whole of his life. Special guardianship order in favour of his maternal grandparents. The case concerned a two-year-old child, N. The maternal grandmother is C and the maternal stepfather is T. His mother is M. The LA issued an application for a care order on 12 May 2017 and on the same date, N was made subject of an interim care order. He has been placed with the maternal grandparents, where he remains to date. The LA alleged that M has fabricated or exaggerated medical symptoms in N throughout his whole life. They sought findings of fact against the mother which if made by this court, would lead them to apply for a special guardianship order in favour of the maternal grandparents. In the last nine months whilst in the care of his maternal grandparents, he has no presentation to a general practitioner or to A&E departments or Hospitals other than for his normal annual GP check-ups. He has not been observed or reported to have suffered any seizures or epileptic type fits. The Judge analysed various medical expert reports and was wholly satisfied that any account by the mother that N suffered fits or seizures were false and fabricated. The Judge said the evidence of supporting this finding was so overwhelming that he is satisfied to the criminal standard of proof. The Judge was entirely satisfied that it is in N’s welfare best interests that a special guardianship order in favour of his maternal grandparents is made. In N’s interest, the mother’s contact should be limited to once per month and shall be supervised by the maternal grandparents, and that there may be such additional school holiday contact as they may agree.